The new Wawa in Princeton isn’t new at all. The store layout is no longer foreign; by now the route through construction is already second nature; it is business as usual at the Wa. The change in routine has proved undisruptive, a matter of an additional two minutes of walking time to reach the same old Wawa coffee. The major shift that took place was not one of patronage or location or merchandise, but attitude. In November when the announcements of the Wawa’s move became a reality, a number of friends asked my opinion on the situation in a manner typically reserved for featured experts on news broadcasts. I would not consider myself a specialist in many things, or any things, but this is one area in which I have invested a considerable amount of time, money, and emotion. I mean, I have an “I <3 Wawa” t-shirt and half of the cashiers’ shifts committed to memory. I believed myself to live and breathe the modern American convenience store, but the new Wawa proved that my allegiance to the institution was entirely based on the particular atmosphere in one particular place, now scheduled for immediate demolition. When the new location opened on November 21st, I could not bring myself to be there when the doors opened at 8am. The accompanying pageantry, which included a costumed mascot, was quite frankly an insult to what the Wa represents to me. But I soon discovered that the new store is divorced from the attitude of the store I described in a veritable love letter to Wawa for this publication a year ago. Gone are the conversations about how to quit smoking while waiting in line and the sense that it’s okay to wander around for a while. The Wa’s pulse has quickened, lines move faster, and people shuffle in and out; in short, it has lost the character of a destination. First of all, it’s too shiny. I have a lot of respect for the architect Rick Joy conceptually, but the Wa, in my opinion, should be a homey beacon, not a bold exercise in design. 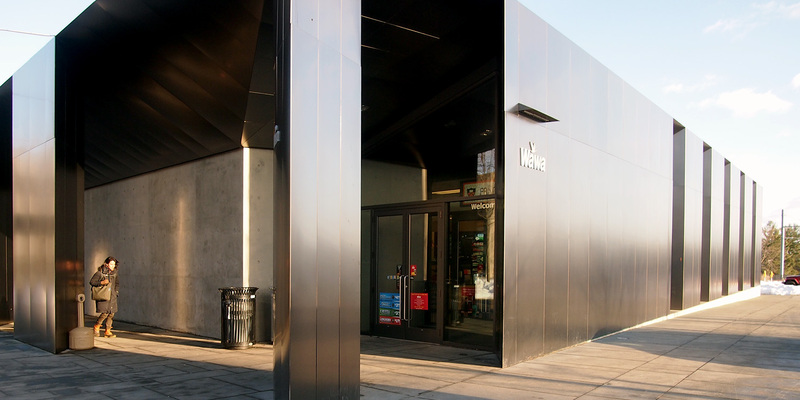 Recently constructed and pristine, the structure feels fresh, edgy even, but with age and wear threatens to resemble a brutalist freight car repurposed to sell snacks. Rick Joy has designed resorts and residences across the country, with “commitment to harmonize with a landscape” inspired by the “sensory stimulation” of the desert, according to his firm’s website. His vision is impressive, but perhaps best suited for unrelenting sunlight and a sea of sand and cacti; amidst a landscape of construction sites and parking garages, I find myself missing the tan stucco and stepped roof of the former Wawa. Maybe the new Wawa’s outer appearance is irrelevant to its character and what it represents. After all, the very nature of convenience stores is that they are infinitely replicable; that their interiors are ubiquitous from store to store is kind of the whole point. But the old Wawa did not have the sterile atmosphere expected of a mass-market chain—its exterior was covered in flyers and announcements and advertisements, Princeton memorabilia on the walls inside. Obviously, the layers of multi-colored flyers from years of use did not accompany the business in its move. My hesitance to embrace the new Wawa may be due to its transformation at the hands of the University’s Arts and Transit project. It is no longer a community fixture, but a cog in the machinery of the University’s vision. The new store has some Princeton-themed decoration, but it is free from any meaningful indication of its location within a community, specifically a community that is larger than the Princeton campus and its student body. Really, the Wawa’s only perceptible role in my day-to-day existence is as a caffeine vendor. The coffee is the same, so why should I care? The sleek design and University involvement have not fundamentally changed its function, and so I have very little to offer with my criticism other than how it feels. The only real complaint I have is that the internal traffic flow is such that getting straight to coffee requires maneuvering, as opposed to the straight-shot possible with the old layout. Change is a force I often find myself in conflict with, and with its higher ceilings and new address, a former constant in my daily life has proven its own capability to adapt and maintain its relevance as a part of Princeton. I am hesitant to turn a commentary on a fixture in Princeton commerce into a personal reflection, but here we are. I am stuck in my old ways, and fear that my sustained attachment to a building now stripped down to plywood does not bode well for my own ability to move forward. There’s nothing wrong with the new Wa, as reliable and always-open as ever, so perhaps it is my attitude that needs adjustment. In the mean time, Wawa is still there for me with coffee and 27’s while I try to figure things out. I know nothing about the architect Rick Joy (I thought he was a magician), but the new Wa building is emphatically *not* a “bold exercise in design.” It is hideous and atrocious. And “sterile atmosphere” is an understatement; its cost should be reimbursable as a permanent contraceptive. I have been a strong supporter of the arts neighborhood concept from the beginning, but if the rest of it bears any resemblance to the Wa and the repulsive new Dinky station, it will be fit for nothing so much as a remake of “Psycho.” Time to start selling naming rights for the privilege of knocking it all down.